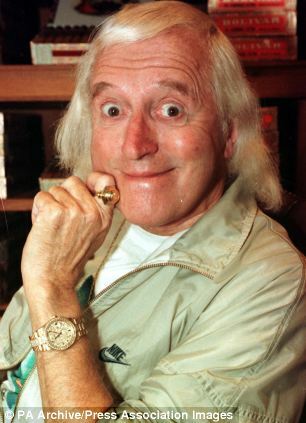 The BBC shelved a Newsnight investigation into allegations that Sir Jimmy Savile sexually abused teenage girls at its studios, it has been revealed. The current affairs show was looking into a woman's claim that the late TV star molested her when she was 14 or 15, in his dressing rooms at a recording of 1970s show Clunk Click. Newsnight then spoke to several other women who said Savile exploited his role as presenter on the hit programme to groom and abuse girls. 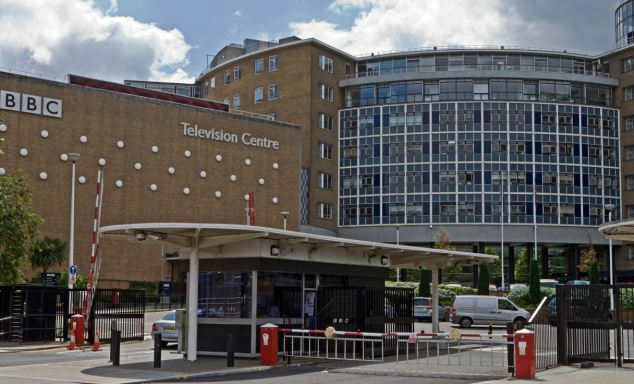 They also heard claims that two other - living - celebrities abused girls at BBC Television Centre in the 1970s, according to The Oldie magazine. 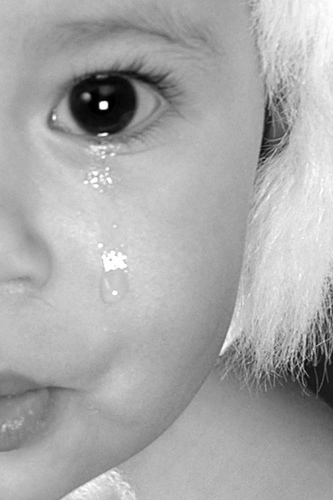 A Newsnight report was due to be screened in December, two months after Savile's death, but was pulled by bosses. 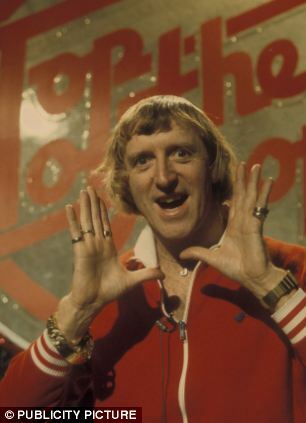 That month, the BBC broadcast two tribute programmes celebrating Savile's career presenting popular shows including Jim'll Fix It and Top of the Pops. The Corporation has now been accused of attempting to cover up the allegations in an effort to protect its own reputation. 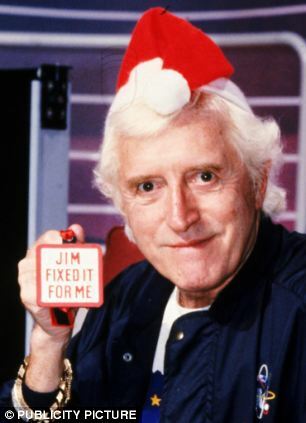 A BBC News source told the Daily Telegraph: 'The extreme nature of the claims about Savile meant that the Newsnight report was going to seriously compromise the lavish BBC tributes scheduled to run later the same month. All the women making the allegations attended Duncroft Approved School in Staines, Surrey, which Savile visited on regular occasions. Two said Savile took them for drives in his car and gave them gifts of cigarettes, records, money and places in the Clunk Click audience, in exchange for 'sexual favours'. 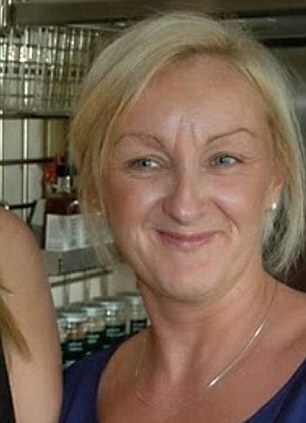 One of the women, now in her 50s, is said to have agreed to waive her anonymity to speak to Newsnight on camera. Surrey Police received a complaint five years ago from a woman who said Savile indecently assaulted her in the 1970s when she was a pupil at Duncroft. Her allegation was investigated but no further action taken. The police have not been contacted by the BBC regarding the latest claims. The BBC has denied the claims. Peter Rippon, Newsnight Editor, said: 'It is absolutely untrue that the Newsnight investigation was dropped for anything other than editorial reasons. 'We have been very clear from the start that the piece was not broadcast because the story we were pursuing could not be substantiated. 'To say otherwise is false and very damaging to the BBC and individuals. To allege that we are withholding evidence from the police is also damaging and false. The notion that internal pressure was applied appears to be a malicious rumour'. BBC director-general Mark Thompson is said to have heard that the investigation was taking place, but to have played no role in its being shelved. Savile - a long-standing BBC television and radio star - died aged 84 in October, but now his reputation looks in danger of permanent damage. Distressed friends and family of the former broadcaster last month accused Newsnight of ‘muckraking’. Savile's friend of 30 years, Stephen Purdew, helped organise the funeral for the TV legend, who also raised £40million for charity during his career. Sir Jimmy started his working life as a miner before running a series of clubs and working as a wrestler and then a DJ. He died at home in Leeds on October 29 last year, two days before his 85th birthday. His private life had long been the subject of gossip and speculation and in December, divorcee Georgina Ray, 40, claimed to be the TV star’s secret love child. She said her mother had a brief fling with the presenter while working as a waitress in the 1970s, and that she is seeking a DNA test to prove she is Sir Jimmy’s daughter. 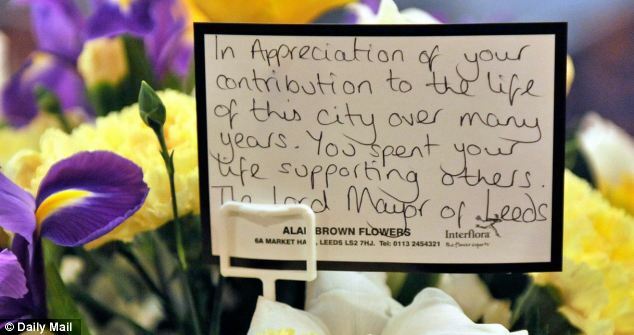 At his two-hour Requiem Mass in St Anne's Cathedral, Leeds, colleagues from TV and radio joined Sir Jimmy's family and friends as thousands of well-wishers watched outside on big screens. The broadcasting legend chose the most elevated position in the peaceful Woodlands Cemetery, in the Yorkshire town of Scarborough, for its spectacular sea view. 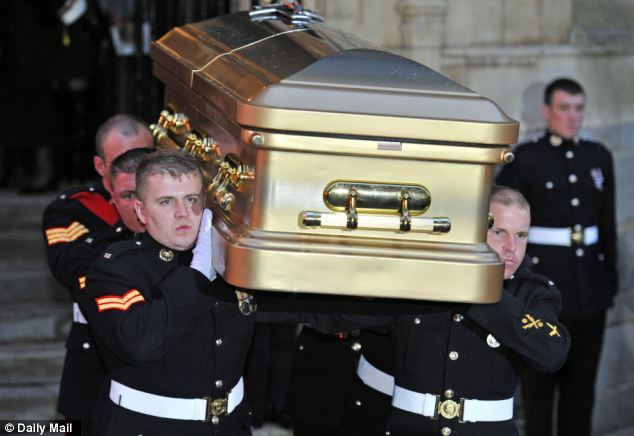 He was buried with his Royal Marines green beret and medal, rosary beads and Help For Heroes wristband and the Prince of Wales and the Duchess of Cornwall led the tributes to him. His headstone is soon to be inscribed with the words 'It was great while it lasted’, ­alongside three pictures of him during his stellar career.